The present downloadable worksheet is a great resource for business/professional students, high school students, elementary school students and adults at Beginner (pre-A1), Elementary (A1), Pre-intermediate (A2), Intermediate (B1), Upper-intermediate (B2), Advanced (C1) and Proficient (C2) level. 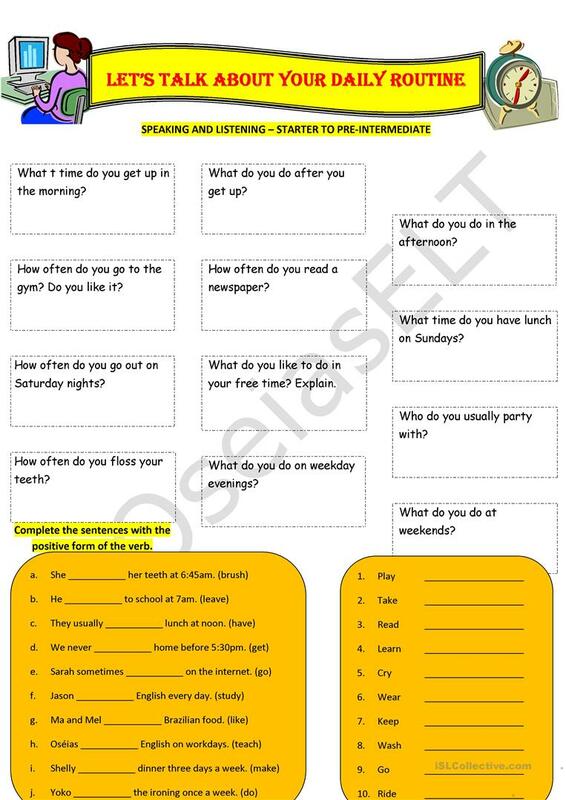 It is aimed at teaching Present simple tense in English, and is useful for enhancing your class' Speaking and Reading skills. It is about the vocabulary topic of Daily routines. English Teacher at Senac Mossoró-RN where is one of the greatest places to learn English as a Second Language. So proud of being a member of this great FAMILY.